Meniscal injuries are a common occurrence, with many people from paediatric age to the elderly suffering from acute and chronic pathology. The most common type of meniscal injury occurs during sports when an impact or twisting force causes a tear in the meniscus. This tear will often present as pain in the knee, as the posse and unstable fragments move inside the knee. In a small number of cases, small tears can break off and float around the knee. Meniscal injuries can also be associated with other injuries. Injuries to the anterior cruciate ligament or collateral ligaments make the overall injury pattern more severe. When the anterior cruciate ligament is injured, and the meniscus is repairable, it is desirable to perform both at the same time. Evidence shows that performing one and not the other can result in a worse long term outcome. 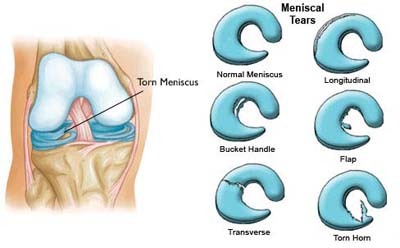 Tears of the meniscus can also occur in degenerate knees, due to wear and tear. These are not as reliably treated as the acute meniscal injury in a sporting person. Sometimes a knee arthroscopy can be done to alleviate pain in these circumstances. Usually pain which is insidious (i.e. starts with no trauma, slowly), does not improve as well as tears that occur due to a fall or trauma. Meniscal injuries need appropriate assessment. A thorough history and examination of the injury will be performed. The examination can give clues about where the meniscal tear is, and what other structures are involved. This may lead to more targeted investigations, and can even make the need for expensive time consuming investigations, redundant. When the diagnosis is not clear, or there is evidence of a more extensive injury, an MRI should be performed as they give the most information about soft tissue structures in the knee, such as the meniscus and cartilage in the knee. An MRI of the knee takes up to a hour to perform, so only a limited number can be performed per day. An MRI is not 100% accurate, as it may miss injuries that can still be significant. They are very useful in planning surgery, as some parts of the knee are not well assessed with a physical examination. There are various ways to treat meniscal injuries. One way is to perform a knee arthroscopy and deride (remove) part of the meniscus that has been affected. This is a selective partial menisectomy. This means that only the portion of the meniscus is removed, which stabilises the tear and stops it from progressing. This uses a series of specialised tools, such a special shavers, and arthroscopic scissors to remove the damaged meniscus. Because the edge of the meniscus has no blood supply, it cannot be fixed. When the meniscus is torn near the blood supply (NB: the blood supply to a meniscus decreases with age, and only penetrates the last 15-20% of the meniscal edge), there is the potential to fix it. It is a more reliable operation in the young, and its results worsen with advancing age. Meniscal repairs can be performed using an all inside, inside out or outside in technique. Dr Chien-Wen Liew performs his repairs using an all inside technique using special anchors which hold the meniscus down. After meniscal rehabilitation, a period of time is required where the patient is non-weight bearing. Typically when a meniscal repair is performed, the length of rehabilitation is far longer than when a partial tear is removed (debrided). If a meniscal tear is repaired and successfully heals, it is much better for the knee than if it were to be removed. Removal of the meniscus removes one layer of padding (suspension) inside the knee and makes the knee more susceptible to arthritis and instability.